The Nautical Institute has launched the third edition of its book The Work of the Harbour Master, which will act as a ‘bridge’ for those coming ashore to take up a port post. 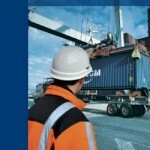 The book has been compiled with the collaboration of the International Harbour Masters’ Association (IHMA). The book will also help those who take up Harbour Master positions, but who do not have seafaring experience; an increasing trend, according to Captain Robert McCabe FNI, Vice-President of the Institute, who launched the book at the 8th IHMA Congress in Cork. Describing the collaboration between the Institute and the IHMA as “valuable” Captain McCabe said some 40 people had been involved in producing the book including the editorial committee, authors of individual chapters and peer reviewers. “The role is hard to define, differing as it does from country to country or even from port to port,” he continued, “and the work of Harbour Masters is often misunderstood”. The practical guide will support Harbour Masters in their changing roles if they are new to the post or if they are called on to work in new areas and take on new responsibilities outside their traditional areas of operation. “Even experienced mariners will find that the learning curve is steep as they take the step from Shipmaster to Harbour Master. It is clear that anyone assuming the Harbour Master role, whatever their background, will need support. This book will help to provide that,” said Captain McCabe. The book is set out to follow the voyage vessels might make as they approach ports until they tie up, and includes issues such as coping with commercial pressures, environmental and cultural aspects, dealing with the media, security and accidents. It explains the role of the Harbour Master through the stages of this voyage. There is no formal internationally-recognised Harbour Master qualification similar to the STCW certificate of competence. In recognition of that The Nautical Institute has devised a qualification which is recognised worldwide – its Harbour Master Certificate Scheme. The book is also devised to support candidates for the Scheme. Alan Coghlan, President of the IHMA commented that those with the role of Harbour Master may have many different titles, some of which don’t even feature those two words. “Hence the book seeks to help all those who have taken on aspects of this complex and unique role in ports – whatever their job title may be.